Now there is a SpongeBob Car Seat that will be perfect for your child when you go on a road trip. This is not just a car seat but it can also be converted to a booster seat so that it can last your child for a long time. 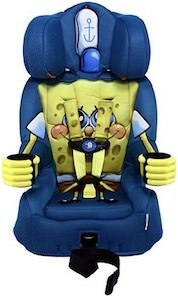 The car seat is dark blue with on the back an images of SpongeBob and his arms go onto the arm rest complete with the cupholders becoming his hands. And safety is important so it is great to know that this seat is Insurance Institute for Highway Safety “Best Bet” rating for booster car seats and exceeds Federal Motor Vehicle Safety Standards (FMVSS 213). So give your kid the best seat in the car that just looks just amazing and stunning. Now you can wear a cool Squidward Surrounded By Morons T-Shirt. If you are a SpongeBob fan that feels a lot like Squidward then this SpongeBob shirt is what you need. 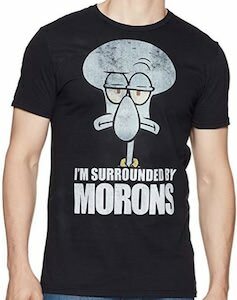 This t-shirt is black and on it you can see a in a slightly worn look a picture of a sad looking Squidward and below his image is says in big letters “I’m Surrounded By Morons” and I am sure we all feel like that sometimes. You can get this Squidward t-shirt in sizes Small – 2XL and all are made from 100% cotton. And the shirt is unisex so it will look great on both men and women. If you like SpongeBob and taking a nap then you should check out this fun women’s SpongeBob pajama set. The sleepiest includes a yellow tank top with the face of SpongeBob Squarepants on it and a pair of shorts that are light blue with SpongeBob all over it. You can get this SpongeBob pajama in many women’s sizes and they are made from 100% cotton to feel just perfect. A pajama set like this is great for sleeping but works great for lounging at home too. Now there is cute women’s SpongeBob sleep set that you should check out. The women’s pajama set includes a light blue tank top with on it SpongeBob Squarepants and a heart that says “Lisa Frank” on it. And then there are black shorts that are covered in many rainbow colored pictures including SpongeBob and unicorns. 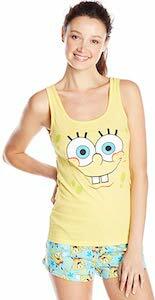 The SpongeBob sleepwear is made from 65% polyester and 35% rayon and it comes in many sizes. 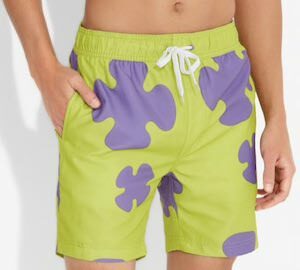 Now you can be sleeping in SpongeBob style or just lounging around the house on a hot summer day because the tank top and short are made to keep you cool when it is hot. Now you can dress you dog for Halloween in this adorable SpongeBob dog costume. The dog Halloween costume is available in many sizes so that you can get one that fits your dog best. 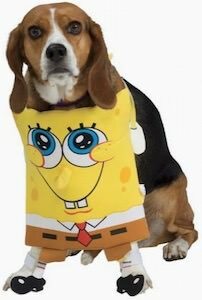 The SpongeBob Squarepants outfit simply fits around the neck of your dog and then SpongeBob is hanging in the front and also attaches to their feet and that makes it looks adorable when they walk around as SpongeBob or even better when they sit down just like the dog on the picture. If you and your dog like SpongeBob and need a fun outfit then this costume is what they need. If you want to take SpongeBob to school, work or other adventures then you have to check out this SpongeBob character backpack. 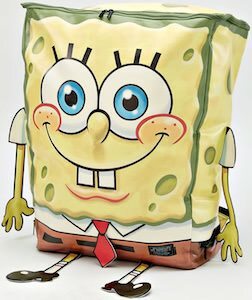 And this SpongeBob Squarepants backpack is just just any backpack it is an oversize backpack as it measures 22 x 20 x 12 inches and it opens on the top giving you access to lots and lots of space. The SpongeBob backpack really looks like SpongeBob complete with arms and legs sticking out and he has it’s typical fun smile with his two front teeth sticking out. Now you can take SpongeBob on all your adventures and he will keep will hold on to your belongings. If you like to spice up your food then you just need this Spongebob and Gary salt and pepper shaker set. As SpongeBob Squarepants works at the Crusty Crab he does know how to spice up your food. 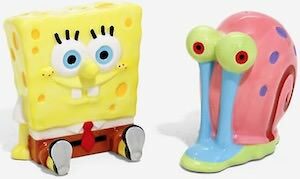 And now you can have a ceramic salt & paper shaker set one of the spice holders will be SpongeBob and the other one will be Gary the snail and not only is it great for making the food spiced right it also will look amazing on your dinner table or the kitchen. 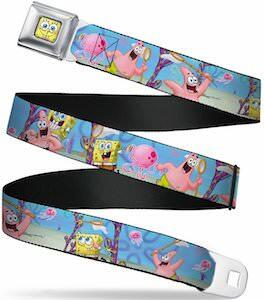 If you like SpongeBob then you just need to get this as it is amazing. If you are a big fan of SpongeBob and likes a nap then you should check out this SpongeBob sleep mask. So now you can look like SpongeBob Squarepants just by wearing this fun sleep mask that makes a big part of your face look like the fun cartoon character. And now you can sleep on a plane, train, or where ever and while sleeping you can dream about a SpongeBob adventure. 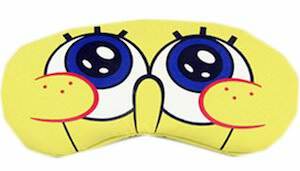 The SpongeBob sleep mask is made from soft flannelette fabric so that it will feel amazing on your head and you just want to keep a sleep for a long time.